Even in this age of international coalitions, the one arrayed against the Ebola outbreak in West Africa is impressive. In September, more than a hundred and thirty nations voted in favor of a United Nations Security Council resolution declaring the virus, which is rampant in Liberia, Guinea, and Sierra Leone, a threat to international security and creating the U.N. Mission for Ebola Emergency Response, or UNMEER, devoted to fighting the virus. The mission was put under the control of Anthony Banbury, a veteran U.N. troubleshooter, who hoped to tackle the job without the red tape that often bogs down U.N. missions. Within a week, Banbury had assembled a team of international experts, selected from thousands volunteers from the U.N.’s myriad agencies, and headed off to kick-start operations at his new field headquarters, in Accra, Ghana. President Obama has also made Ebola a top priority, ordering sixty-five health professionals, supported by nearly four thousand U.S. troops, to Liberia to help oversee the construction of eighteen mobile health clinics there. The United Kingdom has undertaken a similar initiative, dispatching seven hundred and fifty troops and medical teams to Sierra Leone, a former British colony. Other countries, including Japan and India, have made donations of money, equipment, and small teams of medical personnel. Last week, after coming under criticism for not doing more, China announced that it will send its own sizeable military contingent and medical corps to the region. Cuba has long been known for its roving teams of medical doctors and nurses. Indeed, Cuba, an island nation of eleven million people, with eighty-three thousand trained doctors—one of the highest proportions of doctors in the world—has become something like the world’s first responder to international crises in recent years. 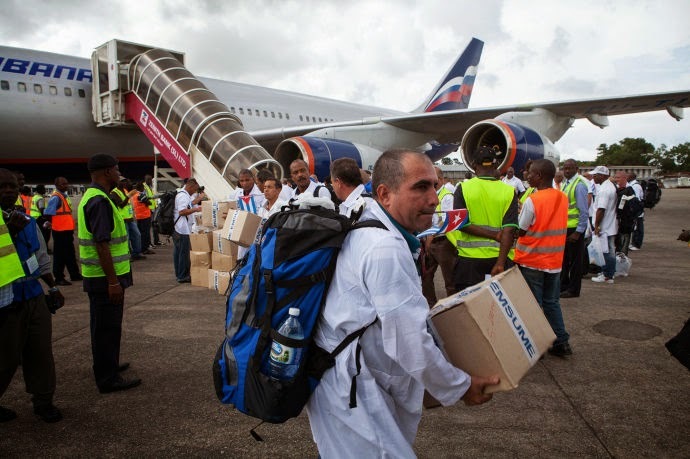 It dispatched hundreds of Cuban medical personnel to Pakistan after an earthquake in 2005 and to Haiti following the catastrophic 2010 earthquake there, as well as to other far-flung emergencies. At any given time, there are an estimated fifty thousand Cuban doctors working in slums and rural areas in as many as thirty other developing nations around the world; up to thirty thousand work in Venezuela, in a bilateral aid-for-oil arrangement that was initiated by the late President Hugo Chávez. Cuba’s outsize gesture in West Africa has not gone unnoticed, and may pave the way for the start of some Ebola diplomacy between Havana and Washington. On October 19th, Secretary of State John Kerry named Cuba as a nation that had made an “impressive” effort in the anti-Ebola campaign. Ten days later, following a Havana conference on Ebola that was attended by two American officials representing the C.D.C., in a highly unusual break with procedure between the two nations, which do not have normal diplomatic relations, Raúl Castro said, pointedly, “Cuba is willing to work side by side with all nations, including the U.S., in the fight against Ebola.” Returning on Friday from her own fact-finding tour of the Ebola-struck countries, the U.N. Ambassador Samantha Power also pointedly praised the Cuban mission. A Cuban Brain Drain, Courtesy of the U.S.